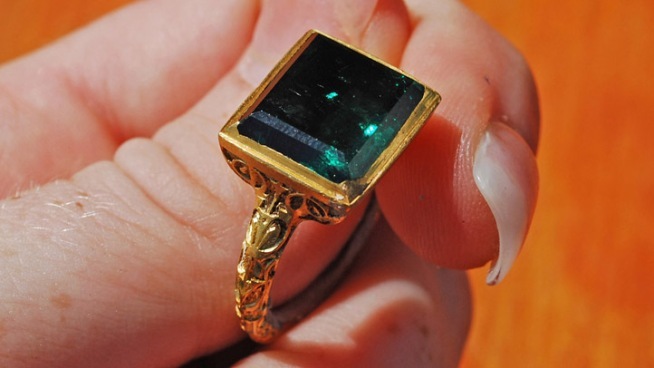 An ancient gold ring with a rectangular cut emerald found Thursday is believed to have come from the Nuestra Señora de Atocha. The famed Atocha shipwreck site in the Florida Keys coughed up another treasure Thursday when salvagers said they discovered a 10-karat emerald ring initially valued at $500,000. A crew with historic salvagers Mel Fisher's Treasures found the ornately carved gold ring while searching for the long-lost sterncastle of the Spanish galleon Nuestra Senora de Atocha, which sank off the Keys during a hurricane in 1622. The ring was found with two silver spoons and two other silver-encrusted artifacts about 35 miles west of Key West, within 300 feet of where a gold rosary and gold bar were found in April. "It is exciting because we are moving into virgin territory, an area of the Atocha Trail that has never been worked," said vessel captain Andy Matroci in a statement. Fisher's Treasures has been working the Atocha site since 1969, hauling up approximately $450 million in silver, gold, and emeralds after the wreck and its "mother lode" was first discovered in 1985. An infamous eight-year legal battle over the treasure with the government ensued before the Supreme Court ultimately ruled in Fisher's favor. The sterncastle of the Atocha has yet to be found, most likely having been scatered by a second hurricane that hit the area shortly after the ship was driven into a reef in the Dry Tortugas, according to Fisher's website. The crew of Mel Fisher's Treasures believe that a second major treasure cache is hidden within the missing sterncastle, probably having been stored in the captain's quarters of the ship for safekeeping. A spokeswoman has said the company will have the ring appraised by an independent party.